A crisply trimmed hedge is the perfect way to divide a garden. We like our hedges in these parts. Maybe it’s because a healthy green hedge is such an attractive backdrop for more colourful garden inhabitants – or maybe it’s the sense of enclosure it gives, the sense that our home is our castle and by enclosing it with a wall of green, it marks out the boundaries of our territory and somehow makes the space more our own. A well chosen and well maintained hedge can certainly do these things, as well as giving us shelter from prying eyes and chilly winds, so it’s no wonder they are a fixed feature in many of our gardens. If you have an established hedge, you will need to trim it at least once or twice a year to keep it in good shape. The time of year you should trim depends upon the type of hedge you have, and on whether it’s a formal or informal flowering hedge. 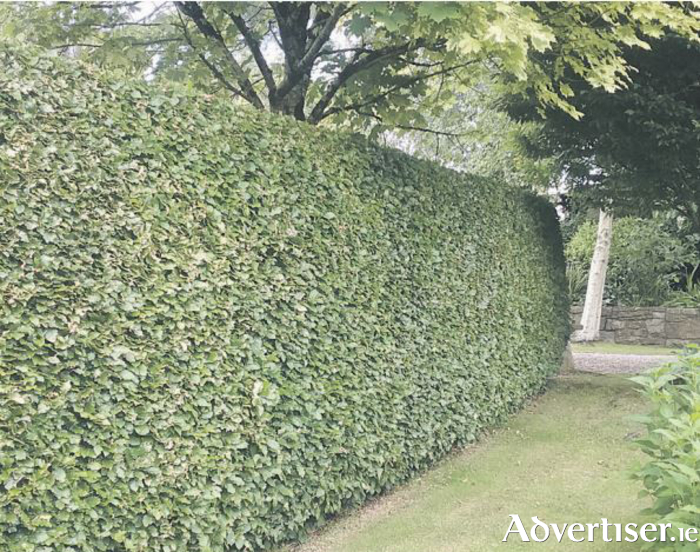 Box hedges need a trim in early summer followed by a light trim to neaten them up in late summer, as do privet, Loniceranitida and Prunus laurocerasus – the ever popular cherry laurel. If you have a Leyland Cypress hedge, you will probably need to trim two to three times during the growing season, as you really don’t want this vigorous customer getting out of control. Beech and hornbeam should be fine with one trim in mid to late summer. The most important thing to remember when trimming is that hedges should always be cut “on the batter” – this simply means that the top should be slightly narrower than the base so that light can reach the leaves from top to bottom, allowing for healthy growth. If you cut the hedge dead straight, as though it were a wall, or worse still, with the top being wider than the base, you risk leaving the bottom of the hedge in shade so it can’t grow properly, and your hedge will grow bare and leggy at the base. It’s also a good idea to trim on a dry but overcast day if you can, to prevent the newly cut leaves being scorched by the sun. The gentle snip-snipping of shears as a hedge is lightly trimmed is one of the most relaxing sounds of the summer garden. I find the effect is enhanced by a good book and a glass of wine, enjoyed in a leisurely fashion while someone else is actually doing the work! Always check for nesting birds before you start cutting to avoid disturbing them – the nesting season would usually be from around the beginning of March to the end of July, but could be longer for some species, particularly those who raise several broods in one year.